Computerized Polygraph that includes a Laptop Computer and the LX5000 Polygraph System. The EDA Assembly has been designed for maximum efficiency and serviceability. It includes an EDA Cable Plus 2 Reusable Snap Electrodes (76642SP & 76643A-5L) and 50 Repositionable/Disposable Electrodes (76642R). For use with LX4000B/LX5000. 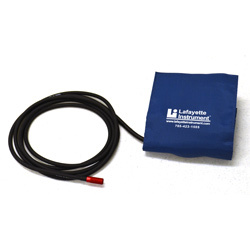 The Lafayette Instrument Company patented standard blood pressure Kovacic-style cuff for the LX5000 and newer LX4000 computerized polygraph systems eliminates problems associated with a loosely wrapped cuff and ensures that the cuff does not shift away from the brachial artery during application. Our patented Kovacic style cuff eliminates problems associated with a loosely wrapped cuff. Designed for individuals with large upper arms. The Universal Accu-Cuff is designed to measure the arterial blood pressure of an examinee during a polygraph examination. The finger cuff is designed to potentially improve the examinee's comfort. It can be used as an experimental alternative to our popular arm cuff. On one end a plug of the EDA Cable connects to the EDA channel. The opposite end of the cable is bifurcated into two cable branches both ending with a snap connector. Pneumatic Pneumo Assembly for use with our LX5000, LX4000A, and LX4000B Computerized Polygraph Systems. Vital Parts Kit that includes Pump Bulb Assembly, Blue Pneumo, Sliver Pneumo, Standard Arm Cuff, Package of Disposable EDA Sensors, Snap-On EDA Sensors, and an EDA Cable. Includes 20 O-Ring seals for quick disconnects and a tool for installation.